No matter what you are looking for we can help you out. 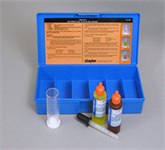 We have the water testing kits you need as well we stock a large inventory of replacement reagents. If we do not have it let us know and we will try and find it for you. 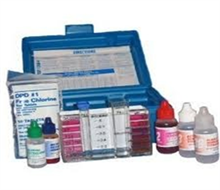 This kit includes tests for chlorine, pH, acid and base, alkalinity, calcium hardness and cyanuric acid. 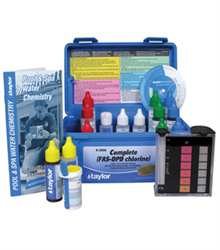 This Taylor Pool Test Kit comes with a heavy-duty case, and each solution comes in a .75 oz amount. The complete set also includes a waterproof edition of Pool and Spa Water Chemistry Guide to make sure you know your water is safe. This kit tests for sodium chloride (salt). This Taylor Pool Test Kit comes with a heavy-duty case, and each solution comes in a 2 oz amount. 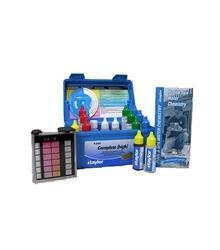 This kit includes tests for chlorine, pH, acid and base, and alkalinity. 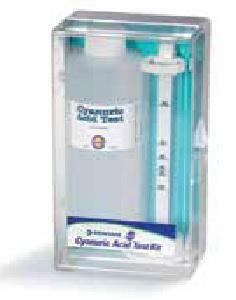 This kit tests for Cyanuric Acid/Turbidity (Stabilizer/ CYA).